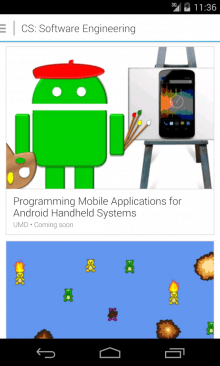 It has been a good month for Android apps. So let’s take a look back at the pick of the new tools to hit Google Play over the past 31 days. 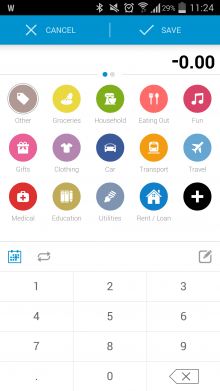 Following its launch for iOS last July, Dollarbird finally brought its awesome personal expenses tracker to Android this month. Dollarbird is what you get when you cross a smart calendar app with a budgeting app, and helps you track and forecast all your spending. 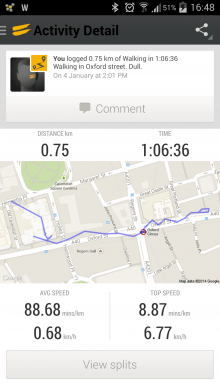 Tribesports for Android is a GPS fitness-tracking app that pretty much replicatesits iOS counterpart, and if you’ve used any other similar app, it won’t take you long to get to grips with. 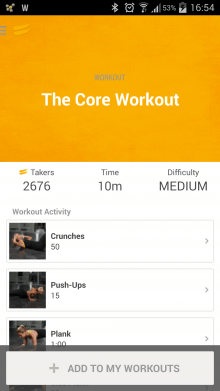 You can log runs, cycles, workouts, and specific sports/classes, with real-time stats and progress graphs illustrating your endeavors. 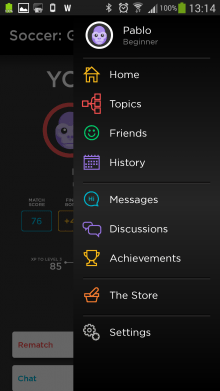 Four months after it arrived for iOS, Icelandic startup Plain Vanilla Gamesofficially launched QuizUp for Android users too, following a short invite-only beta period. 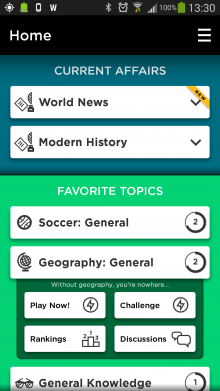 QuizUp follows the likes of Words With Friends by letting you pit your wits against buddies and strangers from around the world in a test of your knowledge. The Android incarnation pretty much replicates the iOS experience to the core, then there are no real surprises in here. QuizUp for Android notched up one million downloads in its first week alone. While the prospect of a new calculator app might not set your saliva glands into overdrive, it’s worth your while giving CALCU a shot, purely for its attention to design detail. Launching initially with a default dark skin, CALCU lets you select from twelve themes, all underpinned by the same slick navigability and UX. The main part of the calculator is pretty standard, with the result of your sum appearing at the top, and keypad at the bottom. 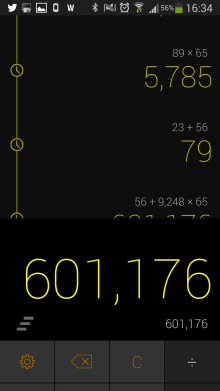 By swiping down, you can view the calculation history tape, while swiping up on the keyboard reveals additional keys, including scientific functions. 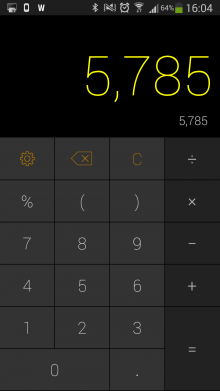 If you’re looking for a simple but good-looking, nice-to-use calculator app for Android, CALCU is worth your time. 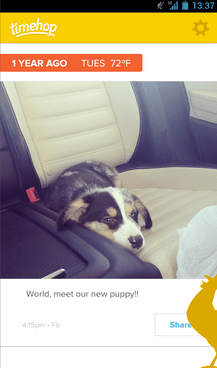 Timehop, a popular service that ‘goes back in time’ to show you past posts on various social media sites, finally landed on Android this month. 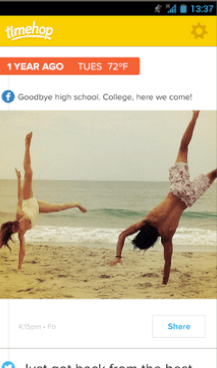 The Android app brings together your old photos and posts from your iPhone (if you have one), Facebook, Twitter, Instagram and Foursquare, and replays them in the future to remind you of key events from your past. Link Bubble is a new entrant to the mobile browser space having only launched a couple of weeks back, but we expect this to rack up a fair few fans moving forward. 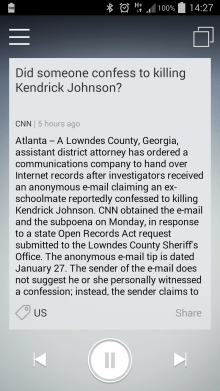 The browser sits in the background waiting to ‘intercept’ as you click on links from any app on your phone. So, if you’re browsing your feed in the native Twitter Android app (for example) and you see a link to a photo on Instagram, Link Bubble will automatically start loading that in the background (when you click it), meaning you don’t have to sit starting at ‘redirect’ screens on your phone, be it a redirect to the Instagram app (if you have it installed) or Instagram on the Web. The same goes for any links from Facebook, Airbnb, Evernote, Dropbox…basically any app. It was a long time coming, but iSupr8, the app for creating vintage-looking videos from your smartphone, finally arrived for Android this month. 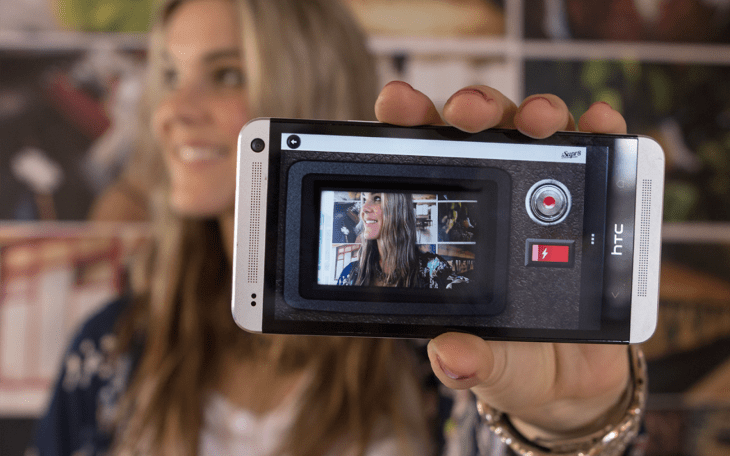 We say it’s been a long time coming because the iOS version launched way back in 2011, before Vine existed and before Instagram supported videos. iSupr8 lets you create retro classics and so so in 1080p HD, while you can choose from a range of film stocks that add a projector frame, flicker, grain, scratches, vignette, noise and film-burn to your video. Recordense is a really nicely-designed audio-recording app that lets you mark and tag any part of a recording in real-time, and allocate a category to it. During the recording process, you simply hit the ‘tag’ button and give it a name – for example, if you want to remember the location of a quote from a keynote speaker. 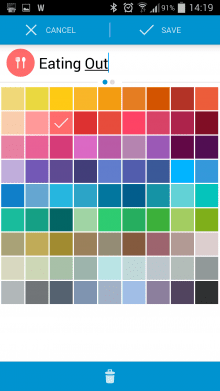 Once the recording is complete, you can save it to a dedicated folder which you name, and also give its own unique color. Now, in the Lite version of the app, you can only create two categories – for more, you’ll have to cough up two of your Earth (US) dollars to procure the full version. Also, you’ll only be able to use three tags per-recording in the Lite version. 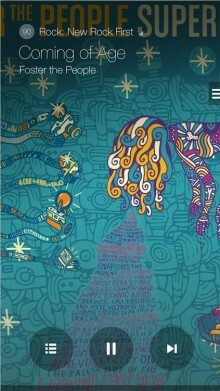 Online learning company Coursera finally came to Android this month, shortly after it debuted its iOS app. 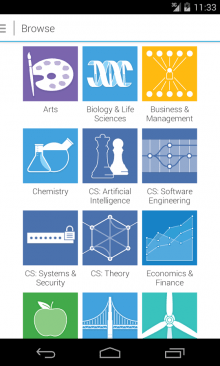 Coursera for Android keeps students engaged with more than 600 courses, provided by more than 100 educational institutions, including Stanford and Yale. 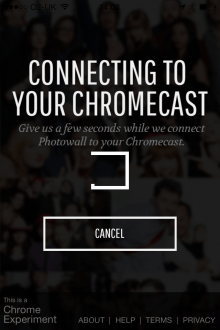 Photowall for Chromecast is officially an ‘experiment’, one that lets anybody take a picture and send it to a Photowall on their big screen – photos can be added via the Web and iOS too. It then creates a YouTube video of this collaboration, which can be shared with everyone. With this launch, Google is trying to encourage third-party developers to use itsrecently-opened Cast SDK. 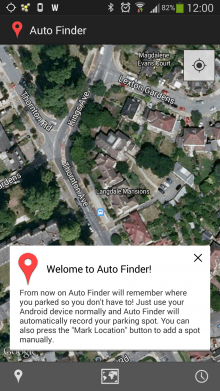 Auto Finder automatically marks your location when it detects that your car has parked using your device’s built-in hardware – zero configuration is required. 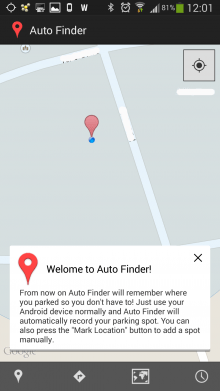 You can operate in satellite or map mode, and you are also able to manually mark a location if you wish. It also serves up directions back to your parking spot. Samsung took a big step into the music-streaming fray this month with a new service called Milk Music, available exclusively for Galaxy devices. Available in the US only for now, Samsung is shaking its leg in a very busy space that currently boasts the likes of Spotify, Rdio, Beats, and Pandora. Indeed, Milk Music is most similar to the latter of these examples, with its Slacker-powered, DMCA-compliant app letting you skip tracks up to six times in an hour for each station. 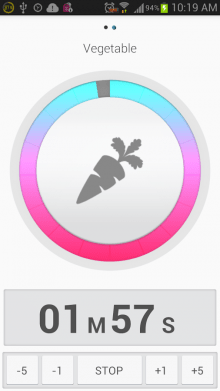 Fiverr took its Task Rabbit-rivaling app to Android this month. To recap, Fiverr lets registered users monetize their skills and resources, which can be anything from Web design to gardening. The Android app, however, is all about browsing, ordering and messaging, rather than listing. If you’re looking to sell a service, you’ll still need to visit the website. 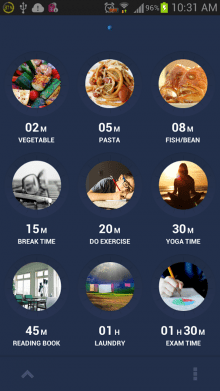 When it comes to timer apps on Android, there’s no shortage, but Wonder Timer is a simple and attractive alternative that packs a punch. Wonder Timer lets you set, save and control multiple timers, with single taps letting you initiate your ‘laundry’, ‘egg’, or ‘yoga’ clocks. These can all be reconfigured with names to suit your own endeavors, and there’s more than 200 icons to choose from. 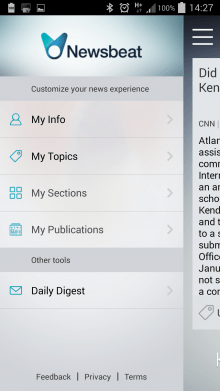 While it does have a US-centric content offering, it also serves up global news tidbits too, though you can’t indicate a specific country other than the US. You can also narrow things down to specific publications, topics, sports teams, and more. It works just like a standard media player – you can skip forward or back if you miss an audio snippet. If you’re on the hunt for more Android apps, check out some of the best ones from February, or put your feet up and peruse through the pick of the bunch from the whole of 2013. Alternatively, you can check out some of the best iOS apps from March too. Update: Google has now officially announced Photowall for Chromecast, and has confirmed that the associated app will be available for Android too. Less than a week after Google finally launched its Chromecast streaming dongle outside the US, landing in 11 more countries, the Internet giant has unveiled a brand new standalone app that lets you create a collaborative photo montage on your TV. According to its description in the App Store, Photowall for Chromecast does exactly as it says in its name, though oddly the so-called ‘Chrome Experiment’ seems to be an iOS-only affair for now. That said, we expect an Android version will be arriving shortly too, as the existing iOS app doesn’t seem to be fully operational yet. 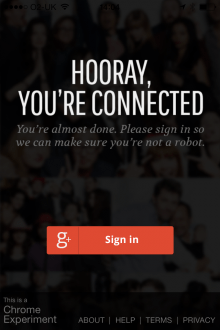 When connecting your Chromecast to the app, you’re asked to sign-in using your Google+ credentials so it can “make sure you’re not a robot”. But then, after giving you the option of which browser to use to sign in, it just takes you to a blank page with a password field in it (see screenshot on the right below). Thus, it’s likely the iOS app has just been pushed live early – though we have reached out to Google for clarification on this front. Photowall for Chromecast lets anybody “take a picture and send it to a Photowall to instantly see it on the big screen” – photos can be added via the Web too. It then creates a YouTube video of this collaboration, which can be shared with everyone. Thus far, Google’s Chromecast has pretty much been about streaming video from your mobile phone to your TV, with a handful of third-party apps integrating with the service. 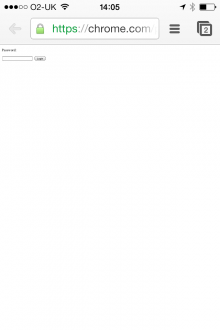 And Chrome users on desktop can mirror more content from their screen too. Now, with a new standalone app in tow, Google’s looking to appeal to the photo-taking fraternity too – though perhaps it’s more about encouraging third-party developers to use its recently-opened Cast SDK for developers.